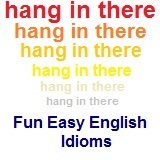 ﻿ Fun Easy English - new american english idioms letter h.
In this lesson you will learn American English idioms beginning with the letter H. You will learn the definition and study the usage of each idiom. had better should You had better go now or you will be late for class. The expression literally means that the distance between two things is only as great as a hair is broad. 1. The cars turned suddenly to avoid a collision. They missed each other by a hair’s breadth. 2. Bill came so close to the edge that he was only a hair’s breadth away from falling over the cliff. hair stand on end She became frightened Her hair would stand on end every time she watched a horror movie. hale and hearty well and strong My uncle is a hale and hearty fellow who never gets sick. The expression is usually used to describe a threat that is not likely to be carried out. 1. Beth has been so cold and rude to me lately, I have half a mind not to invite her to my party. 2. Roger was tired of his job and frequently threatened to leave the company. He had half a mind to quit, sell his house, and sail to Europe. The expression suggests that when something is only half baked, it is not completely cooked, i.e., not properly prepared. 1. John suggested some half baked idea to get rich quick. Anyone with any brains could see that it wouldn’t work. 2. You come in here and present some half baked plan to reorganize the company and fire half of the employees. That won’t go over too well with the workers! The expression is used to describe what may seem to be less than half the effort, a small part of the effort or just the beginning of the effort, but which in fact goes a long way to getting the work done. 1. Once you narrow down the topic for your dissertation, that’s half the battle. Doing the research and writing it is the other half. 2. I finally bought all the materials to build those bookshelves. That’s half the battle. hammer out agree to The union and managers were able to hammer out a new plan. hand down arrange to give after death She plans to hand down her jewelry to her daughter. hand in submit I went to the company early to hand in my job application. The expression refers to two people or things being as close to each other as the good fit of a hand in a glove. 1. Tom and Kate were made for each other. They go hand in glove. 2. Those two workhorses pull that plow as though they were one animal. They work together hand in glove. hand it to give credit to You have to hand it to her because she worked hard and was successful. The expression literally means to handle someone with gloves made of very soft kid (young goat) leather. 1. The boss is a difficult person to persuade—you have to approach her very carefully and put your ideas forward in just the right way. She has to be handled with kid gloves. 2. You can come right out and tell me what the problem is. There’s no need to handle me with kid gloves. The expression is usually used with money. It suggests that one draws in a fist full of money while the other hand is being extended to gather in more money in a continuous motion. 1. In the ten years we owned that house, we were never able to get it into good repair. We poured money into it hand over fist, but nothing helped. 2. Paul’s candy was such a success at the fair, his stall was always busy with buyers. He was taking in money hand over fist, faster than he could count it. The expression suggests that a person’s need is so immediate that what he collects in hand goes straight into his mouth and that there is no room for saving or planning ahead. 1. When Brad lost his regular job, he had to take any temporary one that came along, and he never knew when he’d find another. He lived hand to mouth. 2. Some people in areas affected by drought live a handto-mouth existence. They collect what little food they can and never have enough to save some for another day. hang in there continue despite difficulties She plans to hang in there even though she is taking eight classes this semester. hang loose relax Just hang loose for another few days. hang out come to Do you always hang out at this park? hang tough stick with We need to hang tough on our decision. The expression is used to describe an obsession or concern that may be regarded as somewhat eccentric, unreasonable or illogical. 1. Alan refused to let Jan pay for her movie ticket, even though the two were not on a date. Alan has a hang up about what is socially acceptable and who should pay. 2. Please don’t use that kind of language or tell that kind of joke around me. I’m old-fashioned, and I guess I have a hang up about such crude behavior, especially in mixed company. hang up quit I have decided to hang up my teaching job. Synonym: monkey business 1. The woman knew that her husband sometimes met with friends, both male and female, from before they were married, but she felt confident that there was no hanky panky going on with any of the women. 2. The children’s mother thought that the children were just a little too quiet. She thought they must be up to some hanky panky. 3. The manager in charge of the warehouse suspected that someone was stealing some of the equipment stored there. There was definitely some hanky panky going on. HAPPY GO LUCKY carefree 1. Nothing depresses Charlie—he always sees the bright side of life. He’s really a happy-go-lucky guy. 2. Sometimes sad events happen, and you just have to learn to deal with them along with the good times. Life can’t always be happy-go-lucky. The expression probably originates from the time of vaudeville when a show consisted of several acts, each by different actors. It was hard to succeed if one’s act followed another that was extremely popular, because the audience would compare the two and expect the second act to measure up to the high standard of the first. 1. The last manager of this department was hardworking and well-liked by everyone. I doubt anyone else will be as good as she was—she will be a hard act to follow. 2. My job here is fun, stimulating, and the pay is good. If I ever leave, it will be a hard act to follow. The expression suggests that using a hoe (a garden tool) to weed a row of plants can sometimes be a difficult task. 1. Going to medical school is not going to be easy. In fact, it will be a tough row to hoe. 2. Life can be a hard row to hoe. You have to put a roof over your head and food on the table, and it’s not easy for anyone. hard sell pressure The used car salesman used a hard sell to get us to purchase this car. have a buzz on was slightly intoxicated I had a buzz on after the third martini. have good vibes feel good about I have good vibes about our new secretary. have it all together feel mentally all there Recently I don't have it all together. HAVE/GOT IT MADE to have no problems; to have achieved success 1. Elaine has a great job, a nice home, and a good family. She doesn’t need anything else; I think she’s really got it made. 2. Remember Larry, the artist? He married a wealthy woman and now he doesn’t have to do odd jobs to support himself anymore. He has it made. Compare to: he who laughs last, laughs best; laugh all the way to the bank 1. The boys thought they had tricked the girls by locking them in the kitchen, but he girls had the last laugh when the boys got hungry and realized they couldn’t get in. 2. Mark was lazy and decided to let Roger do most of the work. But Roger had the last laugh because, in the end, Mark got none of the credit. The expression suggests that someone or something that is head and shoulders above someone or something else is substantially better. Whereas run circles around someone means to outperform someone (usually physically), head and shoulders above someone usually refers to a person’s or object’s character or inner qualities. 1. Lisa’s work is outstanding and no one’s comes close to being so good. Her work is head and shoulders above everyone else’s. HEAD HONCHO a person with power in a company or organization 1. If you want to spend that kind of money on your project, you’ll probably have to get permission from the head honchos. If I were you, I’d make an appointment with your boss. 2. The director wanted to include a big battle scene in his movie, but the head honchos at the studio wouldn’t allow it. The expression suggests that one whose head is in the clouds is out of touch with the reality around him/her. 1. I don’t know where my mind is today—I can’t keep my thoughts on my work. My head is in the clouds. 2. Don’t go to Susan for advice; she’ll give you some romantic and impractical solution to your love life. She always has her head in the clouds. very much in love; uncontrollably in love 1. Richard fell in love with Pamela the first time he saw her, and now he can’t think about anything else. He is head over heels in love with her. 2. In the 1960s, many young girls in the United States and Europe fell head over heels in love with the pop singers the Beatles. heads will roll people will be punished Some heads will roll when the boss looks at the costs this month. The expression suggests that a grapevine, long, tangled and indirect, can act as a means of communication, but the message is not direct and may be distorted or untrue. 1. No one knows it yet, but I found out that the boss is about to quit. I can’t tell you who told me, but let’s just say I heard it though the grapevine. 2. “How did you find out Karen was going to have a baby?” I asked. “I heard it through the grapevine,” answered Julie. The expression is usually used to describe an important and sincere talk between two people. 1. I have to talk to you about something that is serious and very important to both of us. I want to have a heart-to-heart talk with you. 2. You always make a joke about everything, and you never talk to me seriously about things that are important. Don’t you ever talk heart to heart with anyone? The expression suggests that the person carries a lot of weight and therefore influence in a particular field. A bigwig is frequently limited to the business world and suggests a person who is high up on the corporate ladder. A force to be reckoned with can be used to describe someone or something that is powerful, and may instill a sense of fear that heavyweight does not. The expressions heavyweight and lightweight come from the sport of boxing. Boxers are put into classes according to their weights. Heavyweight is the heaviest class, with boxers weighing more than 175 pounds or 81 kilograms. 1. The two important and well-known authors John Steinbeck and Ernest Hemingway are heavyweights in American literature. 2. You cannot dismiss the importance and influence of heavyweight Steven Spielberg on the movie industry. His use of high-tech visual effects has become the new standard for action films. Synonyms: in Dutch; in hot water; in the doghouse 1. I don’t know how the accident happened, but the car fender is ruined. I’m going to have hell to pay when I get home. 2. Your parents told you not to be late getting home again. If you don’t get home on time tonight, you’ll have hell to pay. The expression probably originates from the sounds one might make when clearing one’s throat and trying to introduce a delicate subject. 1. Andrew wanted to ask Gail to marry him but he couldn’t find the words. He stood there, hat in hand, hemming and hawing. 2. You don’t have to be afraid to tell me what happened. Stop hemming and hawing and get to the point. The expression thumb a ride denotes that the traveler solicits the ride by standing on the side of the road and extending his or her thumb toward passing cars. 1. Julian had no car, but he needed to visit his mother in the hospital in another town, so he hitched a ride. 2. The boys had no way to get to the beach, about 60 miles away. They decided to stand by the side of the highway and thumb a ride. HIT OR MISS unplanned or random; equally likely to succeed or fail 1. Sometimes Ann is at home when I drop by to visit her, and sometimes she’s not. It’s hit or miss catching her at home. 2. The repairman’s work is hit or miss. Sometimes the machine works when he’s finished fixing it, and sometimes it doesn’t. The expression originates from the mining and gold-rush days when a person could become rich if he or she found dirt with gold in it. 1. They invested their money in oil wells in Texas and they hit pay dirt. Now they’re the richest people I know. 2. Chuck went off to Alaska looking to hit pay dirt, but I don’t think he’s going to find what he wants. Everything worth finding has already been claimed. 3. The senator’s enemies started to investigate his past in the hopes of finding something scandalous. They hit pay dirt when they uncovered his driving record and found that he had been arrested for drunk driving. The expression originates from gambling, in which the jackpot is the money collected from the gamblers and divided among the winners. 1. Mabel always bought one lottery ticket in the hopes that one day she would hit the jackpot and never have to work again. 2. I went to the library not expecting to find any of the books that were on my list, but I hit the jackpot. I managed to find all seven of them. Synonym: put (one’s) finger on it/(something), get (something) on the nose 1. Henry wouldn’t tell his wife what was wrong, but when she asked him if he had lost his job, she could tell by the look on his face that she had hit the nail on the head. 2. We sat around the table trying to figure out why the project wasn’t working. Everyone suggested ideas and possibilities. When Leslie outlined what she thought the problem was, we could all see that she had hit the nail on the head. to go to bed 1. I’m really tired—I can’t keep my eyes open any longer. I’m going to hit the sack. 2. After a hard day, Richard decided to hit the sack even though it was only 8:00 p.m. The expression is often used in reference to food or drink. 1. The boys were sweating from planting trees in the hot sun. When their mother brought them some cold lemonade to drink, it really hit the spot. 2. I think I’d like something to eat after the theater. A little light supper after the play will just hit the spot. Compare to: head and shoulders above (someone); run circles around (someone) 1. This house doesn’t hold a candle to the one we looked at yesterday. The one we saw yesterday was practically twice the size and had much better light. The expression is always used in the negative. 1. Shirley said she would come, but don’t hold your breath. She often doesn’t show up, even when she says she will. The expression is generally used in the imperative. It is used by an adult to children, a superior to an inferior or between two equals on friendly or intimate terms. 1. The children were ready to go, but their father was not. They kept bothering him until he told them to hold their horses. HOLD (ONE’S) OWN to be able to withstand opposition or attack; to do just as well as other people 1. Sarah may be the smallest child in the class, but when it comes to defending herself, she can hold her own. HOLD (ONE’S) TONGUE to refrain from speaking 1. Ella wanted to talk to Bob immediately, but there were too many people around, so she held her tongue and waited until they were alone. HOLD (SOMEONE/SOMETHING) AT BAY to prevent someone or something that is threatening or attacking from being able to advance 1. The hen held the dog at bay while her baby chicks ran for safety. The expression probably originates from the idea of defending (holding) a fort under attack. 1. The manager left the store to go to lunch. She asked the sales clerk to hold the fort while she was gone. The expression is used in reference to arguments or ideas rather than people. 1. The politician argued that they had to raise taxes, but the reasons he gave didn’t hold water. hole up hide I had to hole up for three days because my boyfriend was looking for me. home free a definite success The new promotion plan is home free. The expression can refer to a physical addiction (sentence 1) or it can have the sense of being very enthusiastic about something (sentence 2). 1. When he started smoking, Keith didn’t believe that the nicotine in cigarettes was addictive, but now he is hooked on it. 2. I love reading detective stories, and I read at least two every week. I’m hooked on them. The expression originates from fishing. One expects the fish to bite only the hook, but in some cases the fish might be taken in so completely and foolishly that it swallows not only the hook but the fishing line and the sinker as well. 1. The children made up such a believable story that their mother fell for it hook, line and sinker. 2. The salesman was such a smooth talker, he could make anyone believe his stories. People always swallowed them hook, line and sinker. HOPPING MAD very angry 1. When Bill found out that Sandra had blamed her mistake on him, he was hopping mad and threatened to tell their boss about all of the things she had done wrong. 2. The basketball player was hopping mad when the referee didn’t call the other team’s foul, but he knew that getting angry would only get him ejected from the game. Horse around emphasizes the physical nature of the play whereas clown around means to act silly, and monkey around means to fiddle or tinker with something. 1. Don’t forget we’re in a library, boys. People are trying to read quietly and concentrate on their work. Stop horsing around. 2. The children should not horse around in the garage. There are too many dangerous tools in there. HORSE OF ANOTHER COLOR a situation or plan which represents a change from what was expected or assumed 1. Yesterday you said you wanted to go to the movies with a friend, and I assumed you meant a girlfriend. If you want to go with Ken, that’s a horse of another color. 2. At first, the unions accepted management’s offer of a 10% pay raise until they realized that management meant to spread the raise over four years instead of over two. To the unions, that was a horse of another color. The expression probably originates from the idea that a person who knew what to look for in a horse (i.e., had a sense for horses) could find the best horses to buy. 1. You just don’t have any horse sense when it comes to looking after yourself. You stay up late, don’t get enough sleep and eat poorly. 2. I took my father along when I went to shop for a new car. He has real horse sense and can spot a good deal. Compare to: lose (one’s) temper; make (someone’s) blood boil 1. When Tammy tried to blame the mistake on Sue, Sue got hot under the collar. 2. I get hot under the collar every time I remember how rude the bank manager was to us. A huff is a feeling of displeasure or resentment. A puff is a burst of breath. 1. All the runners were out of breath and were huffing and puffing by the end of the marathon. 2. Mrs. Rene returned to the shop to complain about the service she had gotten from a new sales clerk. After she left, the manager told the sales clerk not to be too concerned. “Mrs. Rene is always huffing and puffing about something or other. She doesn’t really mean anything by it,” said the manager. Hey do you know any English idioms beginning with the letter H not listed on this page?